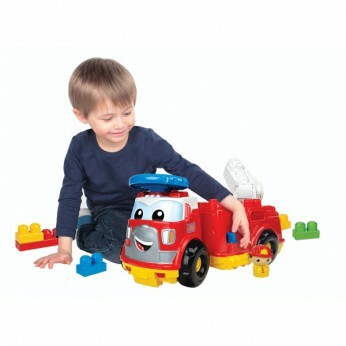 Your little firefighter can take the wheel and steer to the rescue with Firetruck Finn from Mega Bloks First Builders. Kids can take hold of Firetruck Finn’s steering wheel and hit the streets, weaving through traffic to get his Block Buddies Fireman to the scene of any emergency. Lift the Fireman up the ladder, sit him in the cockpit and then swivel to the top! Steering wheel for easier turns; Firefighter ladder raises, swivels and pivots. Includes a Block Buddies Fireman and 13 First Builders blocks. Compatible with all First Builders products. One supplied; Size H29.2, W20.3, D45.7cm; Weight 1130g; For ages 1 years and over; Manufacturer’s lifetime guarantee; EAN: 065541084285. WARNING(S): Only for domestic use. This toy costs approximately £24.99 (for the latest and best prices make sure you check our retailer list for the Mega Bloks First Builders Fire Truck Finn above). In our review of Mega Bloks First Builders Fire Truck Finn we classed it as being suitable for ages 1 to 3 years, 3 years, 4 years but recommend you check the manufacturer specific advice before purchasing.